To continue to learn the fundamental structure, focusing on the development of the communicative skills in speaking and listening. To read and write short paragraphs with the acquisition of kanji. 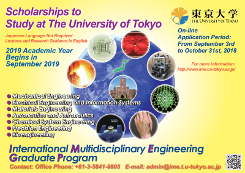 How to apply: Please fill in the application form and send it by e-mail or submit it to IME Graduate Program Office, Room 131A, Engineering Building No.8. For preparing research presentation, writing research documents, and practicing job interview in Japanese. (If there is a vacant seat, you can also ask advice how to study Japanese language.) Please send an e-mail to <japanese@ime.t.u-tokyo.ac.jp> and make a reservation for each lesson in advance. Room 123, Engineering Building No.8.